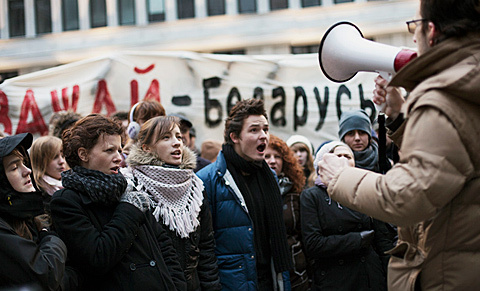 Posted on 30/04/2014 by Laurent Moeri	in Cinema Utopia, Culture of Resistance, Hearts & Minds and tagged Belarus. AntiNote: Link to the full movie with English subtitles at the bottom of the page, as well as an interview with Franak Viacorka, on whose experience the film is inspired and loosely based! This movie is the first independent film about present-day Belarus, an obscure and often misunderstood country in the middle of Europe. Belarus has been ruled for twenty years by “the last dictator of Europe”, Alexander Lukashenko, who has driven his country into isolation and decay. However, a vibrant artistic and cultural life finds its way past censorship, totalitarian control and general apathy to produce little gems like “Viva Belarus”. Posted on 26/04/2014 by Laurent Moeri	in Culture of Resistance, Revelations, Streets & Squares and tagged Feminism, Lina Alaafsin, Palestine. Posted on 20/04/2014 by Ed Sutton	in Culture of Resistance, Hearts & Minds, People's History and tagged Paul Buhle, This is Hell!. On 12 April 2014, Chuck Mertz of This is Hell! Radio (Chicago) talked to activist, educator and author Paul Buhle about bohemians. Perhaps mainstream discourse has already wrung every last drop of usefulness from the topic of “bohemians” (or “hipsters,” or whatever term we’re using for this amorphous subgroup of people)—it has become as much of a cliché as “fratboys” when trying to shoehorn people into categories. But sometimes much more vital questions are embedded in these discussions, like those of gentrification, right to the city, the aristocratization of creativity, and the convergence of art and radical activism. We find Buhle’s perspectives on some of these questions to be of particular interest because in some cases they contradict our own current understanding—and are based in large-scale historical thinking that demands to be taken seriously. Posted on 16/03/2014 by Laurent Moeri	in Culture of Resistance, Hallucinations, Hearts & Minds and tagged Berkin Elvan, Deutsch, Laurent Moeri.